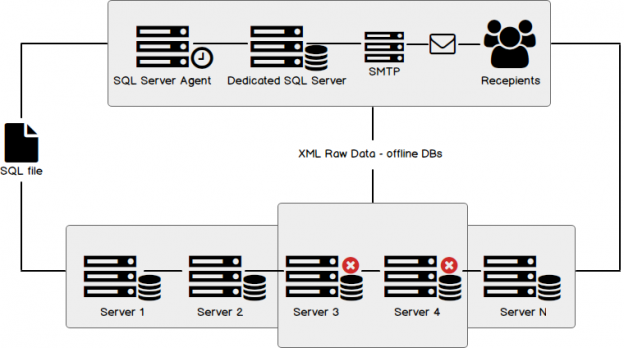 Monitoring a SQL Server database is a critical component of database administration. Ninety percent of the organizations expect the number of databases to increase over the next twelve months. An increase in data volumes can have negative effects on the availability of databases. Hence, SQL Server database monitoring is considered a critical responsibility of a database administrator. Organizations tend to spend a lot of their funds towards enterprise solutions. And due to the sensitive and growing nature of business and user needs, application availability is very important nowadays. Today’s businesses work with huge volumes of data. Sometimes, understanding the granularity of the data is helpful in data administration. Understanding the granularity poses unique challenges though and the database administrator needs to balance the key business and technical metrics of the environment. One of the key technical metrics is disk space estimation, which is vital to capacity planning and forecasting. The simplest way to get this information is by using the system stored procedure, called, sp_spaceused. The growth metrics can be captured periodically and stored in a central repository, a repository dedicated to helping with capacity planning and forecasting the disk requirements. This is a critical part of the day-to-day activities of a database administrator. Having worked in busy dev-test environments, it isn’t uncommon to come across situations where someone detached a database from an SQL server, but forgot to reattach it, or drop it from the server. The next task we are then required to undertake, upon coming across such a situation, is to clean up the traces. 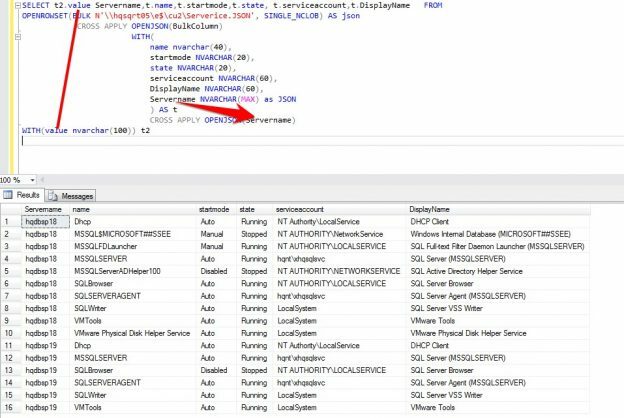 This task can be complicated if the detached databases get deregistered from the SQL Server metadata catalog. In earlier versions, SSMS was included in the SQL Server installer. Now it is a tool that is installed separately. 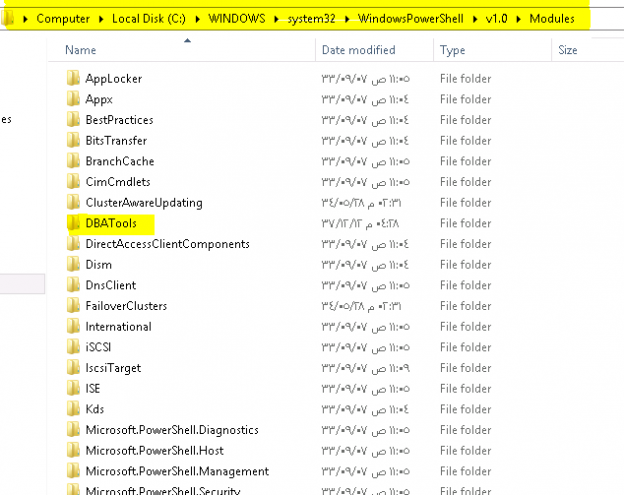 In this new article, we will emphasize PowerShell and DAX. PowerShell is handled in a different way than it was in SQL Server 2016. We will give you some tips to handle these differences. In the second part of the article, we will talk about DAX. 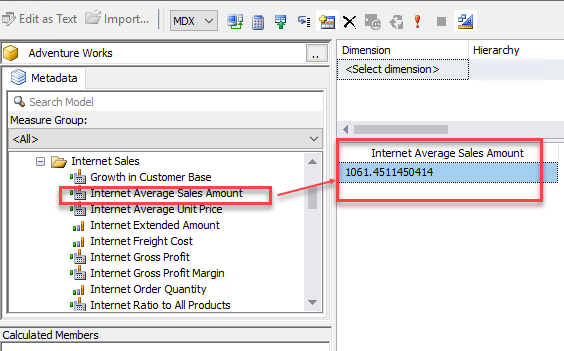 If you do not have experience with DAX, we will give you an introduction to Multidimensional, Tabular databases and you will be able to understand the new features and run your first DAX query in the new SSMS 17. 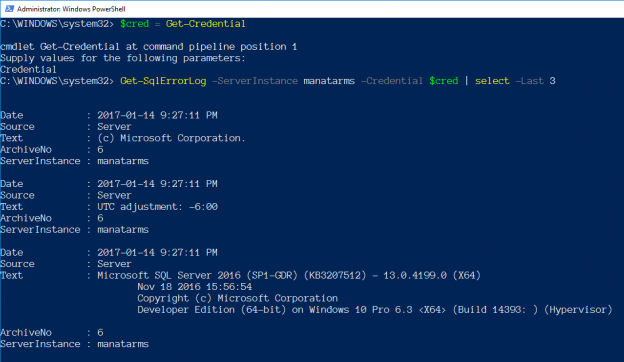 In a previous article on Connecting PowerShell to SQL Server I went over how you use various methods in PowerShell to connect to SQL Server. In those examples though I only touched on using the current user that is running “PowerShell.exe”. In this article I want to pick up and go over how you would use the same methods, but as a different account. I will cover using both Windows Authentication (where supported) and SQL Login authentication. In the article Report Subscription Changes in SQL Server Reporting Services 2016, I covered several changes to standard and data-driven subscriptions that were introduced in the release of SQL Server 2016. However all of those changes related to administering report subscriptions using a GUI (i.e. Report Manager Portal, SSRS Configuration Manager). The release of SQL Server Core, SQL Server on Linux and enhancements on Windows PowerShell, reinforces the growing shift by Microsoft to have SQL Server professionals adopt scripting as one of the ways to carry out their daily tasks. 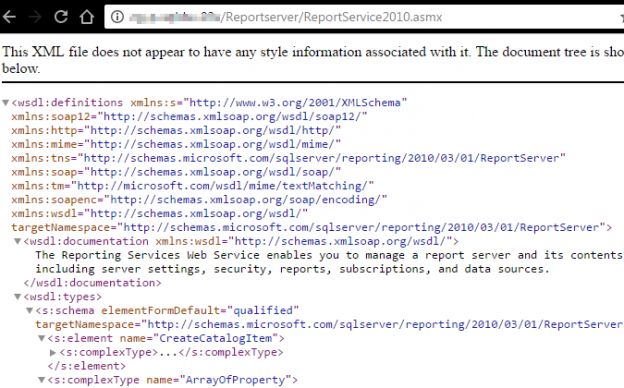 In this article we continue to explore SQL Server Reporting Services (SSRS) subscription feature by discussing some of the Windows PowerShell commands that can be utilised to administer report subscriptions. As DBAs, we all face a lot of challenges while performing the migration of SQL Server databases from one server to another or even the whole servers at some times. The Database Migration process is not always a simple Backup and Restore process so we might need a huge amount of effort if we have to migrate objects which are not included in the native backups for a specified database, these objects are called Non-Contained Objects. If you haven’t heard of dbatools, it’s an open source project out on GitHub dedicated to making life easier for Data Professionals. If you have an idea that you don’t see a command for, you can build it and contribute it to the project. Or you can ask if someone has time to write if for you. The need for this script came about when I took a new job as a DBA. One of my responsibilities was to make sure all databases were available after the maintenance window which ran during the weekend. Rather than log into each database server and check that the databases were online, I had a script do the work for me and shoot me an email. In our first part of this series, we showed how to import a bacpac file using the Azure Portal with Microsoft Azure Storage Explorer (MASE) and SQL Server Management Studio (SSMS) to create a Database in Azure. In the second part, we will show how to import a bacpac file to create a Database using the sqlpackage.exe tool and PowerShell. The xp_cmdshell is a very powerful extended procedure used to run the command line (cmd). This is very useful to run tasks in the operative system like copying files, create folders, share folders, etc. using T-SQL. In this new article, we will show some useful examples about how to use it. PowerShell is Windows Shell that can be used to automate tasks in Windows, Exchange, Azure, SQL Server and more. Let me preface this post by saying that this was a process that evolved over time. It started as a simple sql statement that emailed me a csv file. From there the actual SQL code evolved to display cleaner results. When I learned what powershell could do, I spent some time learning it during my lunch breaks at work. Even when I implemented a powershell script for the first time, it still wasn’t a clean looking report, but it was still better than what we had prior. Even now there is room for improvement but I am happy with the results and hope that it can provide some help to other SQL DBA’s out there. SQL Server Integration Services (SSIS) and PowerShell (PS) together offer a plethora of opportunities, and some shortcuts when having to import, export, or at times moving data. I have come across packages that contain a Script Task with lines and lines of C# code that, done with PowerShell, could make maintaining that package much easier. 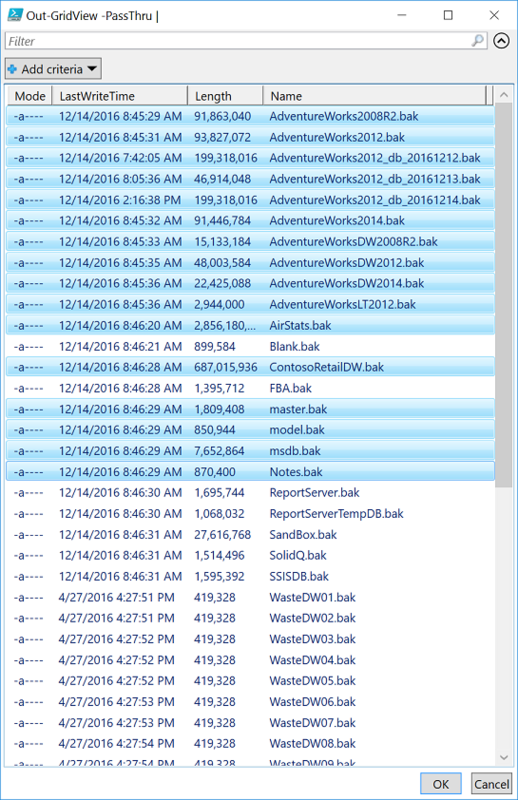 Overall, the most common thing I see Script Task doing is accessing the file system or doing some manipulation on a file. 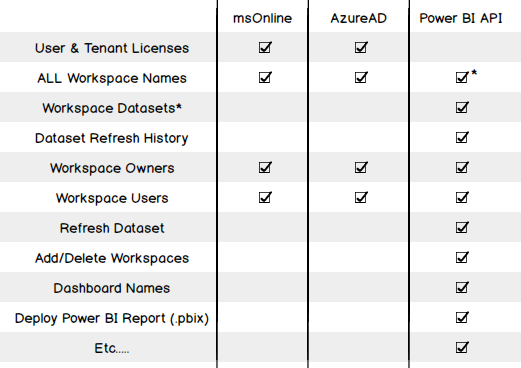 One thing I hope that picks up speed in the BI world of SSIS is utilizing PowerShell for these type of actions. This is not to say one is better than the other as you should pick what is best in your eyes, but when I can do operations against the file system with a one-liner in PowerShell it is just easier to maintain that in the package. 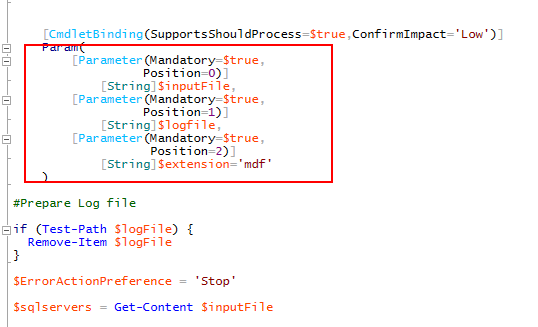 In this article I will go over how you can use the most common task utilized for executing PowerShell code in an SSIS package: Execute Process Task. PowerShell (aka Posh or just PS) is becoming more and more of a tool for operational support and some deployment scenarios. 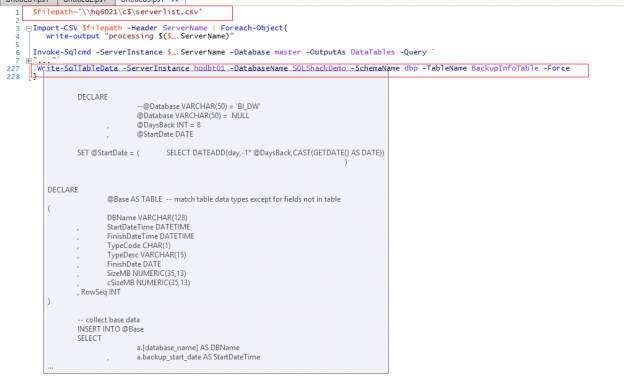 If you need to pull or place data into SQL Server, PS can be a handy way of doing it in both one-off and automated work. 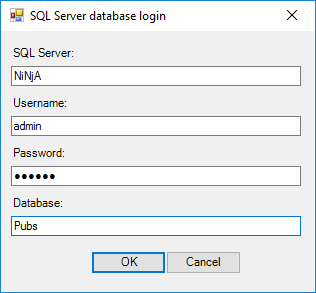 There are a number of ways to connect to SQL Server via PS. In this article I wanted to go over the options that are available to you. If you have used PS for any number of months or years, you know there tends to be multiple ways of performing a task. So it goes without saying if you are building out scripts to use in production to test, test, and test…then test it one more time. 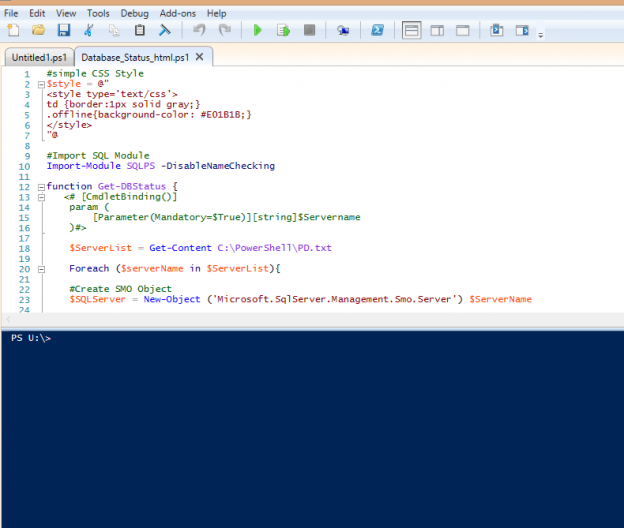 In earlier chapters, I show you how to create your Virtual Machine in Azure using Power Shell. In this new chapter, I will show you how to get information about your VM machine already created. We will use PowerShell cmdlet commands to retrieve the information. The first time that you create your VM in Azure manually using the UI is a very pleasant experience. However, when you have hundred and sometimes thousands of computers it is extremely exhausting and boring to create and configure it. With PowerShell, it is possible to automate several administrative tasks and create scripts to automatically create VMs, enable ports, download and create remote desktop files, administer services, etc. In this new chapter, we will show how to create a Virtual Machine in Azure with SQL Server installed using PowerShell. PowerShell is a shell used specially to automate administrative tasks. It is an incredible tool used to programmatically automate tasks like SQL Server tasks, Exchange tasks, Windows tasks, etc. It is very useful to integrate different Microsoft and sometimes non-Microsoft programs. In this new tutorial, we will show how to install PowerShell for Azure and then how to use it. We will create some databases, edit database properties and retrieve database information using PowerShell.